This is my very first guide so it might not be up to your standards I'm happy to hear any Constructive Criticism and any other thoughts you guys have. PS the guide is very long I wanted to cover a heap of stuff (sorry if you cant get through it all). So I have found this build works quite well and I would like to put it out there for everyone. Sure it might not be formal and junk like most guides are but hey I'm just a gamer guy who enjoys playing Smite who needs fancy for that? Anyway Ares is the Greek god of war which I'm sure most of you know he has a thing with Aphrodite and creates a whole bunch of interesting children with her. But anyway none of that really matters lets get back to this build I'm telling you all about. Ares is a melee magical god (with attack progression "oh yay fun!") he quite possibly has the most amazing and trolly ult in the game (I will outline that later) and his bolster defenses is great for a little protection buff and some amazing CC reduction. So a few things I would like to say straight away I never advocate a set 1 build nor do I advocate a set purchase order/skill level up order I find that I build my items and skills based entirely off the way the enemy plays however personally I like to get my Heartward and Sovereignty because it gives me and my buddies some good sustain and buying these 2 items might not work for you really I'm just posting a finished build and the way you build up to it is all up to you :). They are there for the cool down but again you don't really need them if you don't care about movement speed, if you can land your shackles then even without the boots you will be able to chase them down. Its just nice to have those extra 600 HP and it gives 97 magical power with the exact build I have done up. You could easily swap it out for something like gem of isolation, Rod of Asclepius, Spear of Magus, Void stone or more protective items like Spirit Robe. This item is here purely to add some serious damage. Without this item sits on at least 308 magical power which is still quite respectable so again this could become gem of Isolation or Spirit Robe. This item is nice because it will give you 105 magical power, 200 HP and 10% movement plus the 15% healing buff works on all kinds of healing in the game. This is the item I would choose for penetration because Ares works off DOT his abilities really compliment his kit because he will always get the temp stacks up due to being DOT intensive. This will also reduce the protections for your other magical teammates. Mainly there because it will give you a nice 70 magical power and 50 magical protection. This item mainly just punishes your enemy it reduces their movement by a further 25% there really isn't any way to run away from Ares if you land a shackle while you have Gem of Isolation built. Ares ult will cool down in 90 seconds and also has a further 2.5 seconds until it will pull them so effectively it takes 92.5 seconds to apply the crowd control which is also purification beads (or simply referred to as beads) cool down in 90 seconds this means you probably won't be getting anyone with your ults pull its up to you if you really care but without his ult he has lost a lot of his presence. With 10% cool down you will be ready every 82 seconds giving you 8 seconds to definitely land the ult and with 25% cool down that my build provides you're ult will cool down at 67.5 seconds giving you 22.5 seconds to land the ult. I like to play it a little relaxed more so moving with my team then jumping ahead, after reaching tier 2 of my defensive items I begin my more aggressive play. I find the most important thing to be successful with Ares in the first 9 levels is communication you need to work with your team; be ready to move ahead and take the brunt of it and then fall back carefully, without communication this will not be very effective. The easiest way to start Ares for me is to play a little on the passive side just focusing on removing the minions asap so that the enemy team fall back a little and you get the chance to move where you need to go. Its time to start getting up and in their face, you should now have your two main defensive items built and one other item built and at least tier 2 blink for your ult if that's how you like to play, now its time to start on some damage. You need to be fearless, ready to initiate for you team, be able to divert attention off a team mate when they start getting low and also be ready to dive tower/phoenix dive just remember your bolster defenses and you should be able to start those shenanigans nice and early and stunt your enemy team. Just remember to watch your HP although you need to play fearlessly you also need to know when to fall back. Ideally by now you have about 5 full items and 1 full active you need to step up the aggression even more. Its time to start blinking into their phoenix and using your ult you pull them out, coordinate with your team to tank the phoenix and have them smash it or any gods trying to stand in your way. At this point you can be in their face all the time you will be doing heaps of DOT and keeping them low all the time your bolster defenses is still very important don't forget it. At this point Ares can solo a fair bit I personally have managed to solo 2 enemies but again never forget your team communication. Well if you made it this far I'm glad I haven't lost your interested or maybe you are just reading this to get to the good stuff? Anyway I would like to outline his abilities and my personal thoughts on them. His shackles provides some DOT and a personal movement buff along with the shackled god getting crippled and movement debuff. Late game it provides significant DOT. Shooting fire out of your shield sound good to you? Well its more then a cool effect it provides you two types of damage, your flat damage with scaling and then max HP damage both go off every second also works great on minion waves/jungle camps. Oh and while I'm on this I believe the life steal goes off both the damage types I think. Pulling the enemies towards you might not always sound like a fun idea but its a great way initiate for your team; it can bait out their abilities/actives to make room for your buddies to hit them hard. It also makes a great way to bring enemies back to the fight provided they don't have anything available to give them CC resistance. On top of this the ult offers some solid damage with unlimited range as long as you get the chain them with your ult them before they run (this is where the troll can occur), this can be a great finisher. The stun on his ult also scales up depending on the number of gods you manage to get linked to, starting with a 1 second stun and then an additional .2 seconds per enemy god caught. 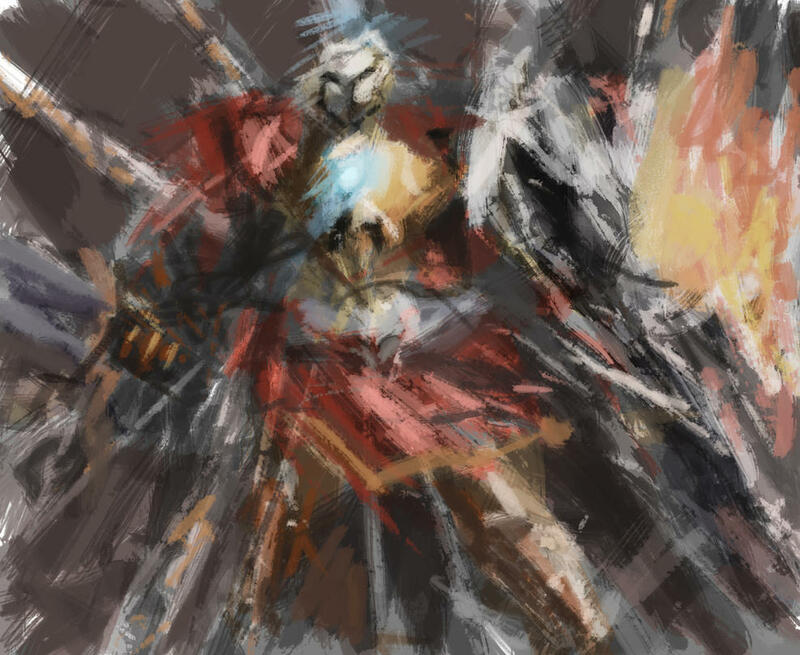 Ares passive gives him a unique edge on the battle field granting him power from items that wouldn't usually give other gods power and granting more power on top of an item in other cases. It is definitely a solid choice. A little more on the Rod of Asclepius is that the 15% extra healing works on all kinds of healing including life steal and salvation. The rest I think you can work out on your own just add 30 magical power to each aura item. Well we all know that bead will save you and so will greater aegis and select gods that get CC immunity in their Kit. But that doesn't mean its useless because his ult gets a heap of attention you can use it as an intimidation tool to force them into spending gold on beads over other items; you can lock down one of their active slots too. When you use your ult chances are they will counter it meaning you have either made them use their escape or their active and now chances are they are running scared or charging you like there no tomorrow, this means your teammates will be able to attack with a lot more confidence. This may not sound like a great thing but it can be, you can use it to initiate for you team, bait out their escapes, tie up some of their gold and if used carefully can secure kills that most people wouldn't be able to (the damage at the end). Now a lot of people like to blink and use his ult; that works great, but it also might put you in a sticky situation being up to 55+ ft away from everyone in the middle of the enemies and moving 50% slower due to your ult; but all in all this is a very solid tactic that will lead to you being quite successful if you communicate with your team. Another way I like to use his ult is to run; in shackle everyone I can; pop my bolster defenses for up to 61 each late game and then ult; this will give you a little more chance of surviving if they turn around and try to kill you while you are in the air; it also stops most gods from jumping out of your reach before you get to ult because of the cripple on his shackles. Experiment with his ult and find your ideal combo because it is tricky to land some times. Also a final little note is that shield of the underworld is great if they start to attack you during your ult. Okay so you know how most things will stop someone from returning to base? Well Ares is the exception. If you time his ult just right as somebody is basing you will land an ult chain on them, they will return to base but the chain will still be connected to them; it will then pull them from their fountain through the map no matter how far the distance. This also works with gods that try to wall off their escape; you will bring them back right through their wall. I'm going to give your build a shot. I use Ares in the support role and always have Watcher's gift starting out. Some of your items seem like no-brainers, but I've never dreamed of putting Rod of Tahuti on Ares. I'm kinda curious to see how hard he hits in the final stage of your build now!! 95502 SepticFir8 I'm going to give your build a shot. I use Ares in the support role and always have Watcher's gift starting out. Some of your items seem like no-brainers, but I've never dreamed of putting Rod of Tahuti on Ares. I'm kinda curious to see how hard he hits in the final stage of your build now! !